(Yes, this is a direct quote. It says Penicillin, a type of antibiotic, instead of Penicillium, a type of mold). What is wrong with this? First, fogging and sanitizers do not remove mold. I believe the mold remediator does not know this. He might not want to because he makes money off using them. Perhaps he believes the mold is treated, if so, he should indicate that. Instead, he presents it as if the mold will be removed. This estimate uses the word, “eradicated”. Sanitizing will do nothing to bring down the level of contamination as he suggests. Testing will still detect the mold. It will still be there. It’s a hostile world for mold. Other molds want to grow, bacteria multiply like rabbits around you and some insects want to eat you. Molds produce toxins to protect themselves. Every mold has a list of toxins it can create. The toxins differ depending on what the mold is competing with. Mold does not produce toxins all of the time. It takes energy to make toxins. If you grow mold in a petri dish in the laboratory by itself, it will not produce toxins. If it doesn’t need to expend the energy, it won’t. Testing for mycotoxins is rarely done in a building. The tests are expensive and you have to test for all the possible toxins that all the molds are known to be capable of producing. What if you miss some? Laboratories test for only three or four. To keep it simple, no professional should be giving you advice based on the type of mold present. The standards for mold remediation are the same regardless of the types of mold present. When people say “black” mold they are referring to Stachybotrys. Stachybotrys is not the only mold that can be black. There are three primary colors, a quarter million species of mold. The same type of mold can be different colors. The front of a mold culture is often a different color than the back. Molds change color with age. Penicillium chrysogenum, the organism that produces penicillin, forms colonies that are initially white but turn blue-green with age. Aspergillus niger produces a white mycelium before turning yellow and forming black spores. Cladosporium can be black. These are a few examples. The answer is simple – mold growth doesn’t belong indoors. Since you can remove it, why wouldn’t you? The answer is also complex. Mold did not grow because it liked the color of the carpet. It grew because there was a source of water. With water came other microorganisms. There is a long list of allergens and irritants due to microorganisms that thrive in damp conditions. Mold is the tip of the iceberg. Some might make you sick, some not. In terms of testing, mold is the easiest – Eventually, you see mold growing. According to the Institute of Medicine of the National Academies, other factors responsible for health effects associated with dampness include: bacteria, allergens of microbial origin, structural components of fungal spores (glucans), structural components of bacterial cells (endotoxins), metabolite by-products including microbial volatile organic compounds (mVOCs), mycotoxins, allergens and pathogens from cockroaches, ants, termites and other insects. Release of these components vary, depending on environmental factors. Dampness can also damage building materials causing or exacerbating the release of chemicals and non-biological particles. Because it is impractical to evaluate a building and its occupants for exposure to each and all of these components, the general recommendation is to remove water damaged materials vs. attempting to quantify the significance of any mold that may or may not be present. What if the mold is dead? How do you tell if mold is dead? A mold spore is like a seed. How do you tell if a seed is dead until you water it to try to grow a plant? How does mold die? Mold can go into a resting stage. It might look dead – it’s dormant. Gardeners call it over-wintering. Some say sunlight and UV light neutralize mold. If that were so, one would have allergies. Sunlight would have neutralized all the pollen and mold in the universe. Does it matter? A pollen spore is allergenic regardless of its viability. It is similar with mold. All mold is allergenic, even the dead (non-viable) spores. All molds have the potential to be toxigenic. Toxins don’t die. In some ways dry mold may result in more of an exposure to mold than wet mold. Wet mold is sticky and does not become air-borne as easy. As mold dries it desiccates into small pieces, becomes air- borne with the gentlest of disturbances, and may pass deeper into your lungs when you breathe the smaller particles. You might test for mold and think you don’t have any because the dead stuff fragmented into gazillions of nano-sized particles that no laboratory can detect. Meanwhile you have symptoms. Just remove the mold and save yourself from wondering. Can I just Spray it with Bleach? You can. Why would you? It would take a lot of bleach, a long contact time, you won’t kill all the mold and the dead mold will still be there, as allergenic and as toxigenic as before. The company the neighbors hired for mold remediation may have treated the mold instead of removed it. Your neighbor might not care or want to know that there is still mold in their home. They probably paid a lot of money for mold remediation. The next buyer or renter may be concerned that mold was treated instead of removed. If you sell your house and do not disclose that the mold was treated instead of removed, you are not disclosing there is mold. Sound troublesome? It is. If you’re paying to have mold removed, make sure it is removed instead of treated. How people become sick from mold is partially still a mystery. Mold does not infect you like a disease. Infection is usually limited to people who are, for example, in the hospital, cut open for surgery. Mycotoxins are substances on the cell walls of the spores and mycelium (roots of mold). You may be poisoned by a substance mold slathers itself with to protect it from other organisms. It enters in your blood stream when you breathe particles of mold or your skin comes in contact with them. I am not a doctor; it’s my opinion – I don’t think mycotoxins are what make most people sick from mold. If you test a house for mycotoxins you have to collect a lot of dust for the lab to detect it. More commonly, eating food that has mold causes people (and animals) to become sick. My experience is that only a few people out of a group will have allergies to mold. If I’m inspecting an office and everyone is having allergies, it’s often not because of mold. There are health problems related to long-term exposure to mold including neurologic disorders such as foggy thinking and organ damage. There are synergistic effects. A smoker may have a greater chance of having a reaction to mold than a non- smoker. If you don’t have symptoms consider yourself lucky. Don’t gamble with your health – get the mold removed or get out. If and how people are affected from mold varies by individual, their sensitivity, how compromised the immune system is, and a long list of factors that make assessing the potential risk to mold a risky endeavor. Just get rid of the mold. Unless you water them, the seeds made from pollen will not grow into plants in your living room. Similarly, unless you water them, the mold spores will not grow into a mold infestation in your house. There are those who dismiss the idea that mold growing in homes is a problem. They can’t see the justification for spending money to remove mold because it’s “everywhere”. Mold growth is not everywhere and does not belong in your home. Some do. Some don’t. Most insurance companies cap mold coverage at $5,000. Where did that number come from? Good question. Insurance companies know the right thing is for them to cover mold. They are trying to cut their losses. If they throw you a bone they hope you will leave them alone. Whether your insurance covers mold depends on the source of water and when it occurred. Typically, there needs to be a sudden incident: roof leaks from a hailstorm, a dishwasher, washing machine or toilet hose exploding. The key word is sudden. Insurance will usually not pay for mold that slowly started to grow years ago and was recently discovered. your adjuster, an accident that is his fault and he tells you you’re not covered. Why do you need coverage? The drying company left, leaving the wall in her bedroom cut open and a big, wet mess. They did not ask her if she wanted to dry things out anyway. Mold grew where the new leak occurred. After an investigation by independent parties it was concluded if the insurance company had not told the drying company to leave, the majority of the mold would not have grown. The insurance did the right thing and paid to clean up the mess. Insurance adjusters are not mold inspectors. When in doubt, they should request an assessment by a certified mold inspector. This should be part of the claim, paid the same way insurance companies pay adjusters and structural engineers. It should not come out of the deductible. If your insurance company tells you they won’t pay for a mold inspection, what they are saying is that they are confident in their own assessment and do not need an expert’s opinion. They assume responsibility for their actions. What ever your insurance company tells you, ask them to put it in writing. Tell them you are recording the conversations you have with them. One of the reasons mold remediation is expensive are the engineering controls: air scrubbers, negative air pressure, containment, and so forth. This is to prevent mold from getting into the rest of your house during remediation activities that generate lots of dust such as removing walls and wire brushing and sanding. If the containment is set up the correct way you can live in your house while the work is being done. It might be noisy. Air scrubbers have big, loud fan motors inside them. The issue is a lot of remediators do not create the containment and install the air scrubbers the correct way. We’ll get to that. Don’t try to kill mold. Mold has a tough shell. It’s made with chitin, the main component of exoskeletons of arthropods. “Dead” mold is still allergenic and potentially toxigenic. Mold can be removed the old fashioned way – hard work instead of chemicals. That’s why mold remediation was traditionally expensive. It doesn’t matter what kind of mold it is. Get rid of it all. Do not waste your time and money doing a science experiment. Sometimes your insurance is to blame. If your insurance company gives you advice remind them that they are assuming responsibility for giving it. Speak in an intelligent manner. If they say, “Just spray it with bleach,” ask, “Are you familiar with the S520 Reference Guide for Professional Mold Remediation? What page are you referencing?” Hire an attorney. 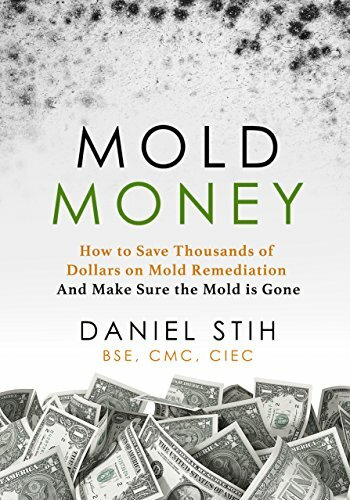 Excerpted from Mold Money: How to Save Thousands of Dollars on Mold Remediation and Make Sure the Mold Is Gone by Dan Stih. The book is available both in print and in the Kindle format.